It’s been a great summer for music so far. This weekend, those of you who aren’t attending the Bayfront Blues Festival will have a chance to hear hot guitars at the Lowertown Guitar Festival, which features guitarists from a number of genres. We also have a jazz artist celebrating his 96th birthday and music and movies in the parks at Como Dockside on Friday, and at Loring Park on Monday (see below). Though I didn’t list them, the Powderhorn Art Fair, the Uptown Art Fair, and the Loring Park Art Festival will all have performance stages as well. Music lifts the spirit. Gypsy Mania Hot Club @ Wolf Park, Saint Louis Park. 7pm – 8:30pm (Free) Pack a picnic and head to this close-in Western suburb of Minneapolis to catch Gypsy Mania: Greg Helgeson, guitar; Greg Schulte, violin; Reynold Philipsek, guitar; and Matt Senjem, bass, and the play hot club swing music that seems fitting for a warm summer night. Elephant Crossing @ Jazz Central, Minneapolis. 8:30pm ($10 Suggested Donation) This is a new band, led by medical resident Ari Nahum on piano. He’s joined by Adam Meckler, trumpet; Gus Sandberg, sax; Ryan Hayes, bass; and Zack Schmidt, drums. George Brooks Bombay Jazz w/Larry Coryell @ The Dakota, Minneapolis. 7pm ($35), 9pm ($25) Saxophonist George Brooks gathers forces with guitar legend Larry Coryell Ronu Majumdar, a master of the Indian bamboo flute; and tabla virtuoso Aditya Kayanpur to create a blend of Indian classical music and American jazz. Given that the classical music of India features improvisation, rich melodies, and dynamic rhythms in non-American time signatures, this should make for a very interesting and solid evening of jazz. Here’s Brooks and Coryell. Katia Cardenas @ Jazz Central, Minneapolis. 7:30pm ($10 Suggested Donation) Cardenas recently impressed many at the opening of Vieux Carre. Now she’s back at Jazz Central, where she and Andrew Foreman, bass; Ted Godbout, piano; and Zach Schmidt, keys will be trying new things with songs by Amy Winehouse, Ella Fitzgerald, Aretha Franklin and others. Graydon Peterson Quartet @ Studio Z, Saint Paul. 8pm ($10) Bassist Peterson started this quartet a few years back with Adam Meckler, trumpet; Joe Strachan, piano; and Adrian Suarez, drums, and finally released a very well received CD last year. Tonight they’ll be performing Peterson’s original compositions as part of the Jazz Original Series at Studio Z.
Atlantis Quartet @ Vieux Carré, Saint Paul. 8:30pm ($8) The Atlantis Quartet returns to the space where they recorded their 2011 release, Lines in the Sand and where they last played about two years ago, though now, there’ve been a few changes, including ownership and the name. What isn’t changed is the quartet’s ability to improvise and perform the thoroughly modern jazz that is their hallmark. Public Music for Friday @ Public Kitchen + Bar, Saint Paul. 8pm (No Cover) The Public is a relatively new restaurant and lounge facing Mears Park in Saint Paul. They’ve slowly been adding music to their late nights in the downstairs lounge/bar. Tonight, starting at 8pm, it’s Donald Washington, sax; Doan Roessler, bass; Nathan Hanson, sax, and Tim Duroche, drums. Then at 10pm it’s the Orchestra for Ants, a three guitar outfit with a humorous bent. Jeremy Walker Trio & the Ted Olsen Trio @ The Black Dog Coffee and Wine Bar, Saint Paul. 7pm ($10 Suggested Donation) It’s Saturday Night Jazz at the Black Dog, featuring two trios. The first is the Ted Olsen Trio at 7pm: Olsen, bass; Javi Santiago, keys; and Miguel Hurtado, drums; followed by Walker’s trio at 8:30pm: Jeremy Walker, keys; Jeff Brueske, bass, and Tim Zhorne, drums. Irv Williams 96th Birthday Party @ The Dakota, Minneapolis. 7pm ($7) Like the Energizer Bunny, “Mr Smooth” just keeps going and going. Unlike the drumming Bunny, Williams is a superb saxophonist, who doesn’t seem to have lost his ability to create romantic music. May we all be able to create such great, happy moments at his age. Here’s a video from earlier this year. Sound Skirmish and Drift @ The Acadia Cafe, Minneapolis. 8pm (Tip Jar) Sound Skirmish is a young group, some of whose members have yet to reach 21, yet their talent is undeniable. Members include Patrick Adkins, piano; Levi Schwartzberg, vibes, Ben Ehrlich, drums; and Drew Stinson, bass. The Acadia only features artists who play original compositions. While Sound Skirmish will be playing jazz, Drift is a singer/songwriter duo consisting of Ryan Hedblom and Madelyn Hirschuber. Will Kjeer @ Jazz Central, Minneapolis. 8:30pm ($10 Suggested Donation) It’s been a year since young Mr. Kjeer, a fabulously talented pianist, graduated from high school, during with time he studied (mostly classical) piano at Interlachen School for the Arts in Michigan. He’s been playing around town this summer, but will soon be heading out to Cal Arts in Southern California, so catch while you can and hear his original compositions. Javier Santiago Trio @ Vieux Carre Saint Paul. 7pm ($5) Pianist Santiago has been playing a lot around town, in groups that range from neo R&B to salsa, to straight ahead jazz. Tonight he’s joined by Miguel Hurtado on drums, and bassist Ted Olson, two other talented players in their early 20s. Indeed Brewing Fundraiser for KFAI @ Indeed Brewing, 711 15th Ave NE, Minneapolis. 3pm – 11pm. Okay, I don’t normally publicize a fundraiser without a band, but this has a live broadcast and a singer for part of a show, and the proceeds of all sales for the day will go to KFAI, where I have my radio show. Both Jackson Buck’s Freewheelin’ and Harold Tremblay’s House Party will be broadcasting live, with Harold featuring barrelhouse pianist & vocalist Stephanie Nilles during the 5 o’clock hour, so you can watch broadcasting and a live performance while enjoying the beverages of Indeed Brewing. She’ll then head over to the 331 Club to perform from 7pm – 9pm. MNSKA Presents @ The Driftwood Char Bar, Minneapolis. 9pm (Tip Jar?) The neighborhood bar on Nicollet & 44th will be jumping to the sounds of three ska bands tonight, with the Skruffians, and Rat Rod Ruckus, and from Rochester, New York, Mrs Skannotto. Here is Mrs. Skannotto. Swamp Poppas @ The Eagles Club #34, Minneapolis. 8pm ($5) Get your fill of Cajun, Zydeco, and Swamp Pop tunes from our very own Swamp Poppas. Bring Dancing Shoes, cuz the Eagles Club has one of the best wooden dance floors around. Patio Party featuring IDK @ The Black Dog Coffee and Wine Bar, Saint Paul. 4pm – 9pm (No Cover) Taps and music on the Black Dog Patio on a summer night. Oh, and food available from inside. IDK is a band led by Ukelelest (?) Keldon Ancheta, and includes drummer Aaron Tafoya. Right Track Vinyl Dance Party Anniversary @ The Dubliner, Saint Paul. 9pm (Free) DJs Benjamin Mena, Mike Elias, and Brian Engel have been hosting this First Friday Vinyl dance party for a year now, spinning soul, blues, R&B, and more. Lowertown Guitar Festival @ Mears Park, Saint Paul. 2pm – 10pm. (Free) McNally Smith College of Music is presenting the 3rd Annual Festival, today featuring bluesman Greg Koch, jazz rocker Johnny A., Nashville session guys JD Simo and Guthrei Trapp, and two National Fingerstyle Guitar Champions: Muriel Anderson and our own Tim Sparks. That’s on the Main Stage. 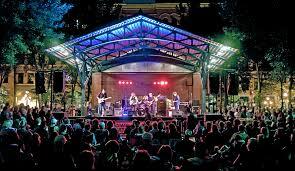 On the Sixth Street stage there will be sets by Park Evans, Toni Lingren, Jerry Kosak, and more. There’s an after party at the Vieux Carré, featuring the Astronauts of Rhythm and Sound, and very likely, some jamming. Summer of Love @ Harriet BrewingTap Room, Minneapolis. 3:30 – 5pm: Recall those days of yesteryear, when pot was way illegal and much less potent, folks were discovering meditation, Indian gurus, LSD, and peace, love, and harmony, beginning with a split set of 60s folk songs by Roady Tate and Dan Israel; 5:15: Steve West and the Northern Stars perform 60s folk, pop, and rock. 6pm British and America Rock, Garage, Animals, Steve West and Friends; 7:15: 60s British and Amierican Pop and Rock by the Lanes; and finally, at 9pm: 60s Psych and Rock by the Tommy Bentz Band. Support Live Music Summer Jam @ Minnesota Music Cafe, Saint Paul. 1pm – 10pm ($10) Here’s an event that’s easy to get behind. MMC is featuring a whole day of many of it’s regular performers, including Mary Elias, The School of Rock, Willie Walker and We R, w/guest Maurice Jacox, The Chris Lawrence Band, JayBee and the Routine, Boogie Wonderland, and who knows who else. The MMC has been highly supportive of Twin Cities musicians for years, providing a space for fundraisers many times each year. The club, and its owner Karen Palm, are even talked about in the book Invisible Prey, by John Sandford, copies of which are always on sale at the club along with lots of other merchandise. Check out Jaybee & the Routine. All Tomorrow’s Petty & Batman @ Loring Park, MInneapolis. 7pm (Free) Holy Moley! Pack a picnic, grab a blanket, and head to Loring Park for Movies and Music in the Park. Tonight it’s All Tomorrow’s Petty, a loose-knit group of musicians from a number of Twin Cities bands see their FaceBook page) who give a 21st Century spin on Tom Petty songs. They’ll be followed at about 8:45 by the very first Batman movie from the 60s, wherein Batman (Adam West) and Robin (Burt Ward) take on your favorite bad guys: The Penguin, Catwoman, the Joker, and the Riddler. Mystic Order of Reverb & Twang @ Schooners, Minneapolis. 7pm (Tip Jar) Get your surf/rockabilly/R&B fix for the week with this very twangy trio, aka M.O.R.T, with special guest Shannon McDonough on vocals. Javier Matos & Bill Bateman @ Bayport BBQ, Bayport. 6pm ($15 includes dinner) Here’s a very rootsy gig for an early week dinner. Blues guitarist Matos takes a night off from his band Javier & the Innocent Sons to bring his bottleneck playing and more to the Bayport BBQ. Bateman was the original drummer for the Blasters. They met while Matos was in Los Angeles early this century and performed together in the Blue Shadows. This entry was posted on Wednesday, August 5th, 2015 at 10:53 am and is filed under Weekly Preview. You can follow any responses to this entry through the RSS 2.0 feed. You can leave a response, or trackback from your own site.